I recently played a fascinating Chess game which has become one of my favorite matches. I liked this Chess game so much that I decided to record it and share it. I played Black, my opponent played White. In the following image (white to move), you will see that if his bishop takes my pawn in H7 near my king, he would check my king while having a rook(D1) target my queen(D8). This move would force me to eat the bishop, while having my queen be eaten by the rook in the next move. My pawn in B2 is nearing Queendom though. Could white checkmate me before that pawn becomes a serious threat? Keep in mind that if I eat his Rook in A1 I’ll have his Rook who just ate my Queen(D8) eat my Rook in E8. My King would be cornered. 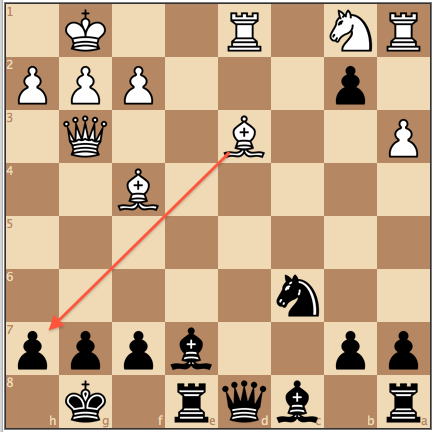 The question is: Is this a wise course of action for White?